God told him to prepare for the apocalypse. And that he did. Getting ready for the end of the world has been an obsession for some people pretty much as long as humans have been around. Whether it’s doomsday preppers setting up bunkers stocked with freeze-dried beef stroganoff or the Norwegian government building a bunker to preserve 400,000 seed samples, we’re very much into the idea of sticking around after the Earth says we’re not wanted. There’s historical precedent for this obsession, in the form of a story most people learn as kids. Genesis chapters 6–9 tell the tale of Noah, son of Lamech, who receives a message from God telling him that he wishes to reverse his act of creation, seeing that the Earth has grown corrupted. He does so by flooding the entire planet with water for 40 days and 40 nights. Not wanting to re-do the work of populating the planet again, God tasks Noah with capturing a breeding pair of every animal on Earth and loading them into a massive wooden boat. After Jehovah abated the floods, Noah, his family and his collected bestiary repopulated the Earth. Knowing what we know now about inbreeding, this seems like a spectacularly bad idea, but it’s just a story. It was more than that to John Roeleveld, an elderly man living in the Dutch town of Eerbeek, east of Amsterdam. In the 1940s, Roeleveld had his own apocalyptic message from God instructing him to start stockpiling two of every animal known to man. This was a tall order, as we now know of a lot more species than in biblical times — 1.5 million, at least. Roeleveld had one advantage over Noah, though: his animals didn’t have to be alive. For the next 40 years, our modern-day Noah set about constructing his ark in the form of a massive network of concrete bunkers buried under his property. Inside, crammed so tightly you could barely walk, were taxidermied animals of every stripe. Foxes, rabbits, deer and other native European beasts were well represented, but Roeleveld’s collection was terrifyingly expansive. He owned a pair of panthers, kangaroos, ostriches and alligators. Some of the taxidermy was professionally done, but much of it he taught himself. In addition to the stuffed specimens, he kept a storehouse of eggs and insects, each preserved in a jar of formaldehyde. The message from God told him that, after the cataclysm, each and every one of them would be restored to life no matter their condition. The location of Roeleveld’s house probably kept him from being discovered, as did his quirky lifestyle — he sustained himself by selling sand from a pit on the property and breeding Pekingese dogs. But as the Eerbeek area got more populated, his neighbors started feeling like something was sort of off with the old man. Eventually, reports of firearms discharging and odd noises in the middle of the night were enough to bring the police to his door. When the law raided his compound, they were flabbergasted by the extent of his mania. Wearing gas masks, they painstakingly excavated his entire collection and took it into evidence. Roeleveld’s yard was also full of busted up furniture and machinery, which he believed God would also re-animate after the apocalypse. Considering that the cops relieved him of an estimated 250,000 specimens, that’s a pretty tall order. They weren’t exactly sure what to charge him with — unlicensed taxidermy, maybe, or “danger to the public health” — but he didn’t spend any time in jail. He never got his collection back. 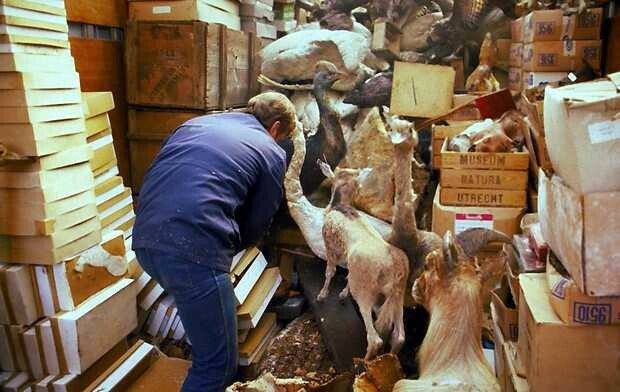 Roeleveld passed away in 1988, and he had managed to amass another 10,000 animal specimens in that time. His collections were split up, with the endangered animal hides destroyed and the remainder sent to the auction house De Zon, who sold them piecemeal. Hopefully his message from God wasn’t true, or those people are in for a surprise when those stuffed animals wake up.